LAS VEGAS, NEVADA (May 7, 2012) - CounterPoint is pleased to announce the acquisition of Maryland-based Convergence Corporation in a move designed to strengthen CounterPoint's position as the industry's leading counter mat manufacturer. This acquisition expands CounterPoint's line of counter mats by incorporating Convergence's exclusive sealed edge construction. 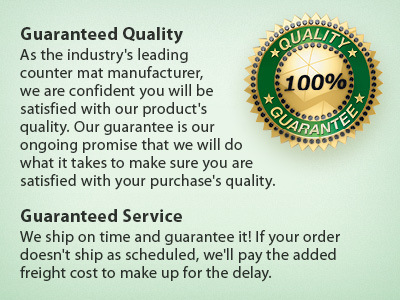 Going forward, this unique, durable product will be branded as "Precision Molded" counter mats. I've long respected Convergence's durable construction and we're thrilled to incorporate their product lines to offer the industry's most comprehensive line of counter mats," says Laura Martinez, CounterPoint sales manager.